Copyright: All pictures, patterns, and photo tutorials are copyright AMK Crochet. Pictures may not be used or claimed as your own. You can sell any items you make from using my patterns and tutorials, but you are responsible for your finished items. If you are selling your finished items online, please link back to my website, www.amkcrochet.com. Do not copy, sell, rewrite or redistribute this pattern or any of the pictures as your own or in any other form. You can link to my site, a specific page, or pattern. You are responsible for your finished items, please monitor children while wearing or playing with items. 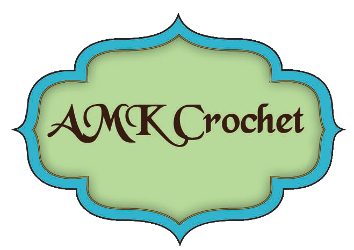 Terms for Purchase: All crochet patterns on AMKCrochet.com are PDF files that will be sent to you, for download. No finished item will be mailed to you. The crochet pattern will list all materials needed and give you complete instructions, for you to create. I stand behind all of my patterns and will answer any questions, at amkcrochet@gmail.com. Due to all of my patterns being digitally downloaded, I cannot accept returns or give refunds.